Luke Haines returns as Cerne Abbus Man, swinging his gigantic phallus over Manhattan, New York. Is it homage, musical pastiche, invocation of like souls, cultural snivelling, the re-imagining of an era? An attempt by Haines to re-position himself within the pantheon of cool rock 'n' roll misanthropes? Who knows, you be the judge. Haines completes his trilogy which started with 9 ½ Psychedelic Meditations on British Wresting of the 1970s and Early 80s and continued on last year’s Rock 'n' Roll Animals. On 'Alan Vega Says', the first track on the album, it appears he brought Pink Floyd on his journey across the Atlantic, the guitar-picking so closely resembling 'Brain Damage'. I’m not sure whether this juxtapose was intended; it certainly doesn’t develop beyond the first few seconds, but it's tempting to imagine the transposition of mythical cosmic rock to "mythic motherfuckin' rock 'n' roll". Perhaps that would be too oblique. Apparently Haines is no fan of Blondie and Talking Heads, according to an interview with website Digital Spy. He does, however, get off on Alan Vega and Suicide, The New York Dolls, Lou Reed and The Velvet Underground, Television, William Burroughs, Jim Carroll etcetera, etcetera. There’s a lot of name-checking going on here. I can’t help thinking that the reference points have been so chosen for being underground cultural benchmarks, untainted by mainstream sensibilities. Is this is how Haines prefers to perceive himself? Maybe Haines is just a fan-boy. Not sure how the band Kiss earned their ticket to the exclusive gentleman’s club, but he likes them too. ‘Drone City’ is Haines paying tribute to Alan Vega and Suicide’s drone-rock. The best that could be said for this uninspired musical appropriation is that it reminds you that Suicide is the rightful forerunner to modern psych-rock. Listening to Wooden Shijps spin-off Moon Duo recently reminded me of this, but Haines isn’t exactly the most obvious beneficiary of Vega’s legacy. 'Bill’s Bunker' is droll with a organ dirge to match. “…talkin’ to Bill about weapons and drugs” doesn’t sound like much fun. Tracks 'Dolls Forever','New York City Breakdown' and 'Cerne Abbus Man' are more like, well, Luke Haines and better for it. Actually quite good. 'Lou Reed Lou Reed' is execrable with its monotonous name-quoting and Frippertronics, and 'UK Punk' is not a lot better. More keyboard dirge on the latter track closes it out, like some mediocre soundbite from an Ed Wood movie. 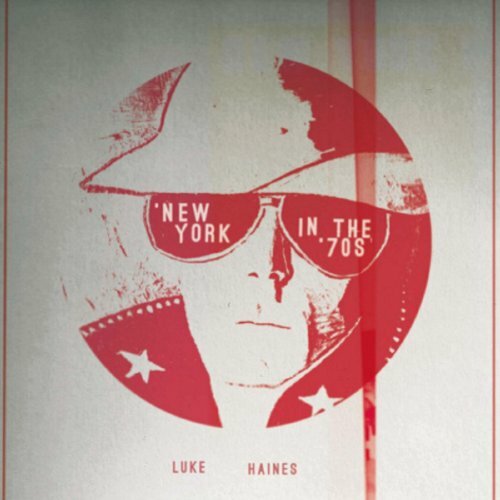 Haines’ admiration for New York in the 70s feels like inculcation, and for me, as listener, I sometimes felt left out. However, some good tracks make it a worthwhile listen for Luke Haines devotees.